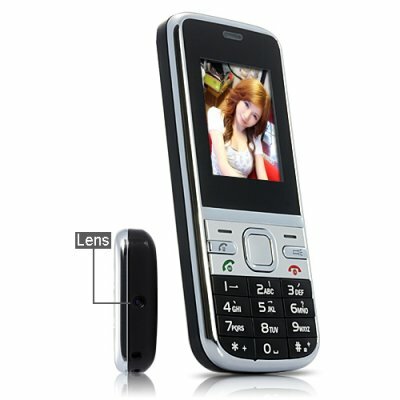 Successfully Added Cell Phone Camera (Nokia Mobile Design) to your Shopping Cart. Cell Phone Camera (Nokia Mobile Design) - looks like a cell phone, but is actually an inconspicuous and treacherous gadget! devices are usually hidden in unexpected objects in order to surprise people, however more and more people are aware of this fact... So what if it was possible to make an innocent mobile phone, that everyone carries, into a smart item? Well here it is! Introducing the Cell Phone Camera looking like an old-fashioned Nokia! This Cell Phone Camera has been designed like one of the classic first generation Nokia mobile phones that tons of people still use. What is more common than this? With the lens ideally located on top of the screen, it provides total discretion while recording the target. Pretend you are dialing a number or typing a message and secretly capture what you are pointing at! Imagine you are climbing the stairs and there is a pretty girl wearing a mini skirt in front of you... then take the phone out and record the situation, while remaining unnoticed. No one will ever know what you are really doing! In addition of all the possibilities a product offers - photos, videos and voices recording - the Cell Phone Camera has motion detection function. A very good feature for those who don't trust their colleagues or partners. They may search your stuff when you are away but no worry since you will be able to record them from now on! What more? There is a zoom to catch details, the playback option allows files to be checked instantly and even deleted if needed, and the initial memory of 2GB is big enough for storage of plenty of confidential data! Be nostalgic - or feign it - and get the Cell Phone Camera with Nokia mobile design to secretly capture whatever you need or want! All this is brought to you at a factory-direct price by the leader in China wholesale and electronic devices, Chinavasion. Please note: This item ONLY functions as a camera and does not work as a mobile phone..